• Dim-Out. Eatonville’s “Dim-Out” regulations were easing up. Dim-out regulations were in effect along many coastal area roads to reduce light, and make it hard for enemy aircraft to identify target locations. The regulations required homes to pull shades and businesses to turn off signs and marquees. • Ration Board Needs Volunteers. The Eatonville War Price and Rationing Board was scheduled to open in August and would service LaGrand, Silver Lake, Alder, Elbe, and Ashford, among others. The call was out for volunteers. 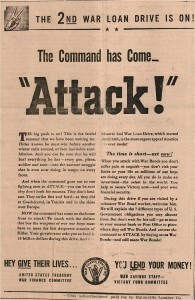 Rationing scarce resources and goods, such as gasoline, tires, sugar, meat, silk, shoes, and nylon, was commonplace in 1943 and the Dispatch was anticipating a run on canning sugar. • The 2nd War Loan Drive. 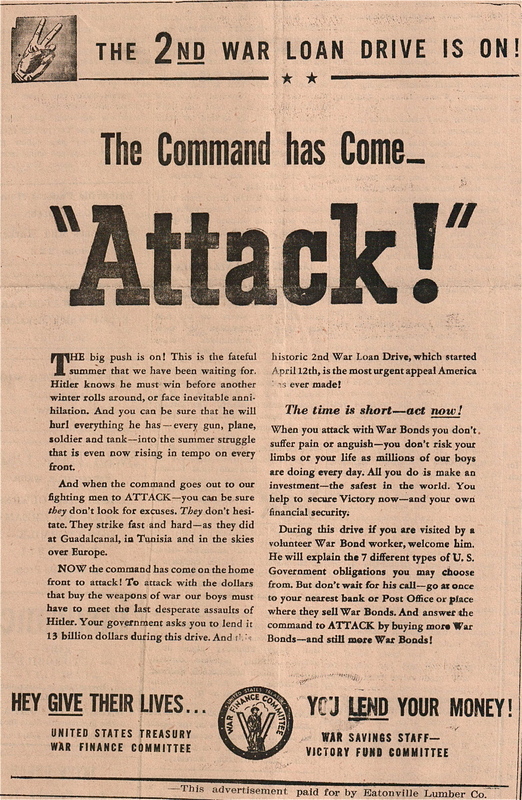 The Eatonville Lumber Company ran an ad to promote the sale of war bonds. • War Stats. The Dispatch also ran information on Eatonville men involved in the war, from where they were stationed to who had been lost. On a brighter note, the Roxy Theater was doing great business and playing 5 movies a week, including Wings and the Woman, the story of one of the first women in uniform. My son worked for Cora and Gail (owners ) at Elbe Shell? gas station filling gas tanks for truckers. Do you have any old photos of the Elbe Gas station and pumps? I can see my son now in jean overhauls with a red bandana with one arm over pump waiting for the next fill up. Gail and Cora have been longtime residents of that area and have given many kids their first job either at their hamburger business or like my son at the gas station. Was it a Texaco or Shell? Hi, I’ll see what other pictures I may have. — Thank you for the great memory.